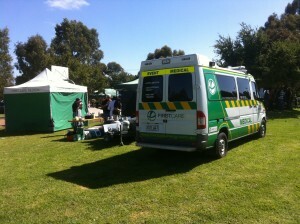 Affordable first aid solutions for low risk events. Our Medics and First Responders are the most economical solution for low risk events such as school/community fetes, sports days, community gatherings, AGM’s, conferences, team building exercises, product launches, and publicity or promotional events. We are equipped with comprehensive first aid equipment including oxygen, defibrillation, emergency drugs and general first aid supplies. Please contact us to discuss your requirements and for a reasonable quote.